England batsmen Alastair Cook and Ian Bell, along with Test hopeful Sam Robson, all scored unbeaten hundreds for their counties on Monday. 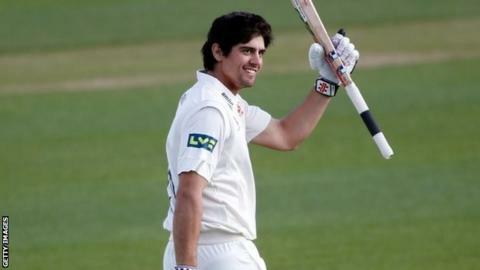 England Test and one-day captain Cook made 139 for Essex against Derbyshire, while Bell hit 144 for Warwickshire against Sussex. Robson enhanced his chances of opening the batting alongside Cook with 144 for Middlesex against Nottinghamshire. Jonathan Trott and Michael Carberry again failed to make an impact. Cook's return to form in an Essex revival at Chelmsford is a welcome boost for England after a difficult winter in which he averaged 24.60 in the 5-0 Ashes whitewash by Australia and faced questions over his captaincy. It is also a timely reminder of his talents in the week in which England interview candidates for a new head coach to succeed Andy Flower and take charge of all three formats of the game. Bell fared little better than Cook in Australia, passing 50 only twice in 10 outings as he averaged 26.11. But after a fourth-ball duck in Warwickshire's first innings at Edgbaston, he guided his team to 387-7 second time round after Sussex made 229. Robson, who qualifies for England on residency grounds, scored five centuries for the Performance Programme and Lions on their winter tour of Australia and Sri Lanka. He pressed his claims by batting for nearly six hours at Lord's, putting on 203 for Middlesex's third wicket with Eoin Morgan - another player hoping to feature for the England Test side this summer - who made 86. Warwickshire's Trott, who is hoping to regain an England place after leaving the Ashes tour in November with what was described at the time as a stress-related illness, was dismissed by Sussex's England bowling hope Chris Jordan for 26. Trott, who made 37 in the first innings after failing against Oxford University last week, later explained his abrupt departure from Australia, insisting that he was "burnt out, but not depressed". Hampshire opener Carberry, who played all five Tests in the 5-0 whitewash by Australia, was caught behind for 27 by Gloucestershire's Cameron Herring off the bowling of David Payne. That followed scores of nought and six in Hampshire's County Championship opener against Worcestershire. England kick off their international summer with a one-day international against Scotland in Aberdeen on 9 May before hosting Sri Lanka and India over the summer. Their first Test match since the Ashes is against the Sri Lankans at Lord's, starting on 12 June.